By admin , in Alzheimer's Disease on April 15, 2019 . Everyone has lapses in memory from time to time. Remember the time that you forgot to cut the price tags off of your clothes before you wore them, or forgot to send your wife flowers on your anniversary? We frequently find humor in stories about times in our lives when memory failed us. Such anecdotes arise even for the families of Alzheimer patients. One of our favorite stories is about a woman who, though in the early stages of Alzheimer’s disease, had been unwittingly selected to serve as a juror in a murder trial. One day, about midway through the trial, the jurors were excused for their lunch break. Much to the court’s dismay, the woman forgot to come back, and the judge had to declare a mistrial! Despite the belief that memory declines sharply with age, this is not actually what occurs. David B. Mitchell, a developmental psychologist, discusses the differences in memory and language that occur with age, as compared to those that take place with Alzheimer’s disease. He explains how some components of memory are lost before others. By understanding the thinking processes of Alzheimer patients, we may better facilitate their adaptation and may decrease our own sense of frustration. Consider these words dinosaur, avocado, tequila. We’ll come back to them later. 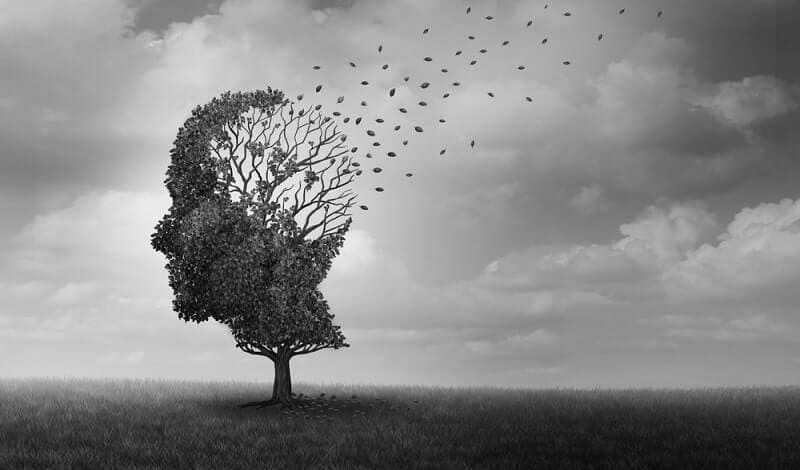 Alzheimer’s disease is often described by professionals as a disorder of memory and cognition (thought processes). Indeed, memory loss is usually the first symptom that the individual or the spouse notices and brings to the attention of the family physician. Difficulty recalling names of familiar places and objects is commonly reported, as well as problems remembering where objects were placed. Other language problems, related to vocabulary, can also appear early, and are virtually inevitable as the disease progresses. A number of assessment scales are now available, both for more thorough diagnosis and for plotting the severity of the disease. Thomas Hutton and his colleagues have developed the Functional Rating Scale, which assesses a variety of everyday behaviors including eating, dressing, speech, memory, degree of confusion, orientation, emotionality, social responsiveness, and sleep patterns. Barry Reisberg has developed Functional Assessment Stages (FAST), and there is a Record of Independent Living (RIL) scale to assess day-to-day functional competence. In recent research, a strong relationship has been found between these functional scales and clinical scales such as the Dementia Rating Scale and the Global Deterioration Scale. These scales are also useful for plotting and predicting stages of functional decline in patients in longterm care settings. For example, the mild cognitive decline stage in the Global Deterioration Scale, developed by Barry Reisberg and colleagues, is characterized by a level of impaired functioning noticeable to co-workers and difficulty traveling to new places. In the moderate decline or late confusional stage, individuals will often fail in attempting to carry out relatively complex tasks such as planning meals and handling their finances. Individuals in the moderately severe stage require assistance in choosing proper clothing, while those in the severe stage have trouble just putting their clothes on. In the very late stages of the disease, patients lose all memory and language abilities (including recollection of their spouse’s name), basic motor skills (such as walking), and bladder control. Since memory and language function are nonexistent in the late stages of dementia, the remainder of this article will focus on the mild to moderate stages. When patients have memory complaints or when professionals discuss memory loss, it is often assumed that memory is a singular trait. In fact, however, there is increasing evidence for several types of memory. The distinction between different memory systems is important because some systems may be affected by aging or by disease, while other systems may remain intact. At least three types of long-term memory representation (conceived by Endel Tulving at the University of Toronto) are important for understanding the differential effects of normal aging versus disease: episodic memory, semantic memory, and implicit memory. Semantic memory contains our vocabulary and general knowledge of the world, information that is available independent of time and context. Who was John Kennedy? What do you usually eat for Thanksgiving? What kinds of clothes should you wear to your nephew’s wedding? What is your spouse’s name? Note the difference between these questions and the episodic memory questions in the previous paragraph. In the memory laboratory, we might ask someone to name some fruits (semantic memory) or to recall the names of some fruits from a list presented earlier (episodic memory). Healthy older adults—compared to young adults— do experience greater difficulty with episodic memory, but not with semantic memory. Alternatively, patients suffering from Alzheimer’s disease suffer loss of both types of memory. For an implicit memory task in the laboratory, an individual might be asked to engage in word puzzles, with no mention of a memory test. Try to complete the following fragments to form words: D_N_S_U_, AV_C_D_, T_QU_L_, A_R_V_R_, G_N_RA_I_N, and E_E_HA_T. Although it’s fairly difficult, when the whole words have been seen previously, the number of fragments completed rises dramatically, providing evidence of memory. This form of memory occurs even when individuals don’t remember having seen the very same words! Even more striking, amnesics—who, by definition, have extremely poor episodic memory—perform at the same level as normals when an implicit test is used. For present purposes, this finding is of great interest because it shows that (1) it is possible to tap information stored in memory not normally available to consciousness, and (2) that separate memory systems can be differentially affected by factors such as aging and disease. We will see evidence that implicit memory is invulnerable to the effects of normal aging and may be spared in Alzheimer’s disease as well. 1. The correct words for fragment completion are: dinosaur, avocado, tequila, aardvark, generation, and elephant. If you read this article from the beginning, the first three should have been easier than the last three.